Maja Maljevic’s latest series of prints and paintings are on view at David Krut Projects from 7 May until 13 June. In this body of work we are introduced to a world of subtle transformations, peopled by strange creatures. Moving fluidly between figuration and abstraction, and deploying colour and form with vigorous energy, Maljevic seeks a visceral response from the viewer, a response from the gut – or the spine, as her title suggests. Maljevic describes her working method as a series of improvisations, which is especially evident in the prints created in collaboration with Jillian Ross, printmaker and manager of David Krut Print Workshop, printer Mlungisi Khongisa and visiting New York master printer Phil Sanders. Maljevic produced the first image on a single large copper plate using a combination of etching, drypoint and spitbite. During a period of intense experimentation, Ross and Maljevic would ink up a particular area of the plate and print it. They would then choose another area and ink up in a new colour. This would then be passed through the press so that lines, shapes and colours from the first printing were overlaid onto the second printing. Many of the motifs and details in the prints – the heads seen as if in x-ray, the wavering grid and the prone figures – originated in Maljevic’s oils. But where the paintings, with their thick application of layers of warm colours and their dense imagery, are bursting with energy, the prints, in dynamic counterpoint, convey a sense of lightness and space. Maljevic has remarked that she approaches a work with a general idea of colours and shapes, but then an image can be completely transformed as new ideas suggest themselves in the working process. Perhaps as a result of this, images overlay or seem to grow out of other images on the canvas. 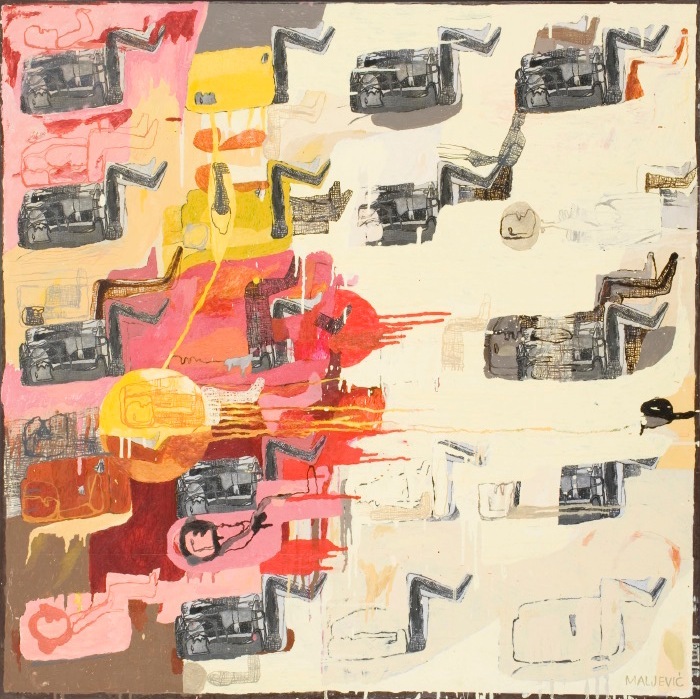 Maljevic has also incorporated collage into her paintings, using everything from photographs and old newspaper clippings of architecture and technology, to photocopies of old paintings. These are used both as backgrounds upon which to compose, or as patchworks or grids that eventually form part of a painted image. Into the Spine runs from 7 May 2009 until 13 June 2009.